The IBEX images (taken from a distance of around 180,000 miles) show an immediate compression of the magnetosphere as it was impacted by charged particles from the solar wind. ENA global imaging enabled the team to determine the precise timing of the compression, to within ±9 seconds. Minutes later, one of the TWINS spacecraft, carrying identical ENA sensors that provide stereoscopic imaging, observed changes in the inner magnetosphere (from a much-closer 28,000 miles). A magnetospheric structure called the “ring current” traps charged particles that gyrate around magnetic field lines. About 15 minutes after impact, the trapped particles propagated down the field lines toward the poles and into Earth’s atmosphere, where they produced additional ENAs. The brief time delay in losing particles to the atmosphere suggests that internal magnetospheric processes take some time after compression from the initial impact. To produce the new images, the team also developed a series of techniques to process the imaging data, including improved procedures for binning, differential background subtraction and “statistical smoothing” of images. 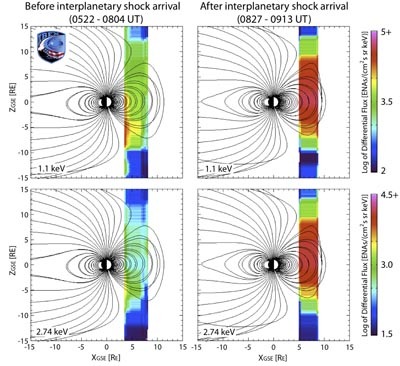 These energetic neutral atom (ENA) panels show IBEX observations before (left) and after (right) the solar wind impacted the Earthâ€™s magnetosphere on April 5, 2010, and increased from one- to two-million miles-per-hour. The magnetosphere, which is modeled in both panels, becomes compressed after the impact and shows a significant rise in the production of energetic neutral atoms (indicated by red). The paper, “TWINS and IBEX ENA imaging of the 5 April 2010 substorm” by McComas, N. Buzulukova, M.G. Connors, M.A. Dayeh, J. Goldstein, H.O. Funsten, S. Fuselier, N.A. 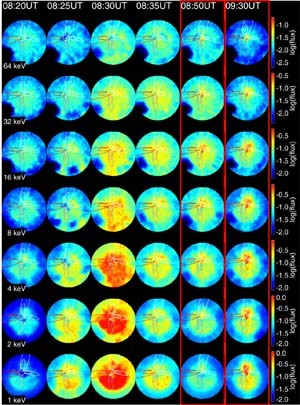 Schwadron, and P. Valek was published in the March 27 online issue of the Journal of Geophysical Research. IBEX is the latest in NASA’s series of low-cost, rapidly developed Small Explorer space missions; TWINS is an Explorer Mission of Opportunity. Southwest Research Institute in San Antonio leads both missions with teams of national and international partners. NASA’s Goddard Space Flight Center in Greenbelt, Md., manages the Explorers Program for NASA’s Science Mission Directorate in Washington. Editors: Images to accompany this release are available at http://www.swri.org/press/2012/twins-ibex.htm. For more information, contact Maria Martinez, (210) 522-3305, Communications Department, Southwest Research Institute, PO Drawer 28510, San Antonio, TX 78228-0510.